Every October, the Medical Library Association celebrates National Medical Librarians Month to raise awareness on the important role librarians play in the health sciences. We’re taking this opportunity to look at the influence medical librarians have on the education of healthcare professionals, the delivery of patient care, and furthering medical research by taking a journey through the career of Catherine Gray-Guinup, RN-BC, BSN. With 18 years of experience in the nursing field, Catherine has relied on the help and expertise of medical librarians at many stages throughout her career. From obtaining her BSN at Spring Arbor University and receiving her ADM from Mercy College of Ohio, where she has been a nursing instructor since 2004, she says medical librarians were essential to obtaining the volume of research that was critical as a nursing student. Catherine continued to utilize the support from medical librarians during research as a practicing Clinical Informaticist. During this time, Catherine co-authored two articles on the growing impact of medical informatics on the nursing profession. Librarians can assist by doing much of the legwork during the initial research process. They will search for resources, pass on the abstracts for review, and the researcher can request only the full articles that fit their research topic. “The medical librarians were invaluable to my work and contribution to the medical field,” Catherine shares. “I never would have had the time to dedicate to the amount of research they performed and they were quick and responsive to my requests.” For this reason and more, Catherine reinforces the importance of the virtual library at Mercy College to her students. Not only do medical librarians aid students in researching and course work, and help with medical research papers, they continue to have an impact on practicing medicine and the development of new treatments and procedures. Healthcare is constantly changing, and it’s critical to have access to new research findings and electronic health records to provide the best patient care. 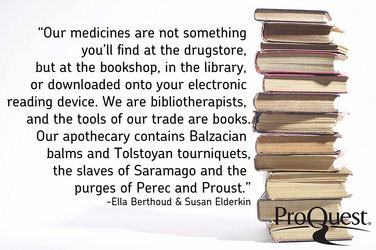 Medical librarians are instrumental in medical practitioners accessing that information. They monitor medical journals and are often familiar with new procedures before someone has even requested information. Catherine’s experience reminds us how important librarians are in the education of future healthcare workers, the delivery of patient care, and furthering medical research. To look over the vetted and reliable medical and health care sources and research options in ProQuest, click here.